With four shades to choose from, complexions from light to dark will find a match with this cruelty-free cover-up. Glides on and blends smoothly with a sponge tip applicator. Shades available: C-7 (fair/medium with beige undertones), C-10 (fair/medium with pink undertones), and C-20 (medium with pink undertones) .25 oz tube is $13.99. From Anonymous of Astoria, New York on 1/24/2017 . 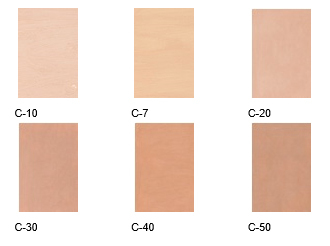 C-7 and C-10, and I assume all of the other colors, are too dark to use as cover up for pale skin. From Anonymous of Bismarck, North Dakota on 2/12/2014 . I ordered my first tube a year ago. I *thought* I had very pale skin, with pink undertones, and ordered C3. It would be great if you have porcelain skin! I was able to exchange it with no problem, because I had not opened it, and was able to exchange it for the C7. The color was ok, but still too light. Going to try C10 OTHER than finding the correct color, I do LOVE the product! From gertie of seattle, Washington on 9/6/2012 . This comes in a tube with a sponge tip applicator, and goes on pretty thick, but thin enough to spread out evenly. I use it under my eyes and one some pink-ish spots low down on my cheeks. It *should* be thick, it's a concealer, not a base, and isn't meant to be applied to your entire face. (Perhaps the other reviewer received an old one?) I'm about to reorder, only in a different color, as C-7 is really quite light. From pinkaholic of new york, New York on 11/19/2011 . My friend has this and i got some and it went on my skin nicely... it was the best concealer i can ask for that's cruelty free. From Leslie Ramos of Austin, Texas on 3/16/2008 . I used Shiseido for years, until they discontinued the shade I wore. Since then, I tried MANY different brands of concealer. I came across Zuzu Luxe at Central Market and have worn it ever since. It's the perfect consistency and the color I used matches my skin tone exactly.